Please join us on Friday 22 January for a one hour mix by Toronto artist Bridget Moser. Members enjoy a drink on the house with good company and a chance to experience Liz Magic Laser’s exhibition after hours. 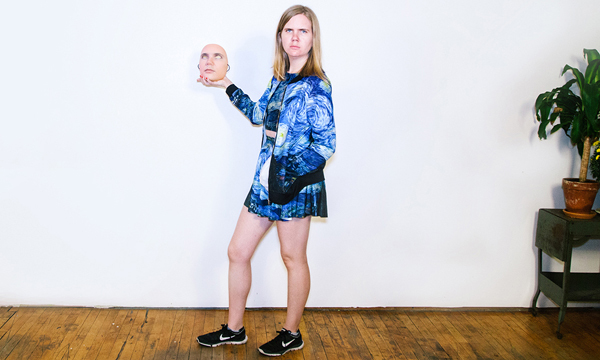 Bridget Moser is a Toronto-based performance and video artist whose work is suspended between prop comedy, experimental theatre, performance art, absurd literature, existential anxiety and intuitive dance. She has presented work in venues across Canada, including La Centrale, Montreal; VIVO Media Arts Centre, Vancouver; Video Pool, Winnipeg; the Art Gallery of Ontario, Gallery TPW, and Mercer Union, Toronto; The National Arts Centre and Carleton University Art Gallery, Ottawa; Owens Art Gallery, Sackville; and MSVU Art Gallery, Halifax. She has presented projects throughout the US and Europe, and has been a resident artist at The Banff Centre and at Fondazione Antonio Ratti in Como, Italy. Her work has been featured in Canadian Art, C Magazine, Visual Arts News, The Dance Current, and a recent collaborative publication with other FAR residents published by Mousse Magazine. Moser is a 2015 recipient of the William and Meredith Saunderson Prizes for Emerging Artists. She was selected to receive this prize by Daina Augaitis, Chief Curator and Associate Director at the Vancouver Art Gallery.